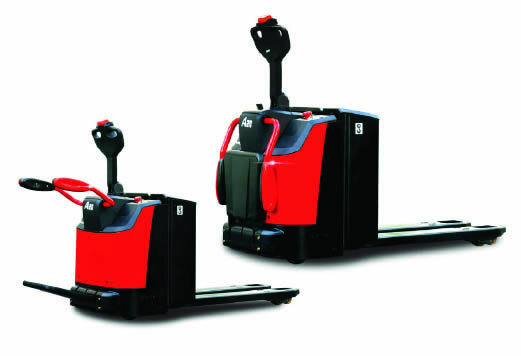 The Powered Pallet Truck Hi Range 2.0 - 3.0t features the latest Curtis AC motor system providing more accurate and stable control. With maximum travelling speeds of up to 9.5Km/h the 2.0-3.0 tonne capacity truck offers excellent acceleration and grade ability, bringing about a greater efficiency to day to day operations. The compact structure has been engineered to offer excellent visibility and easy entrance of the pallet. The low centre of gravity design and steel frame chassis provides a larger residual load capability and longer working life. What’s more it’s high quality hydraulic power unit minimises noise and vibrations, resulting in a smoother and more reliable lifting and landing operation. With three braking types, including a releasing brake, reversing brake and emergency brake, as well as an emergency button the driver’s safety can be ensured at all times.